There's just something about the White Stripes. Perhaps it's the mystery (are they related or aren't they? I mean, they do sort of look the same, but then they do come from Michigan). Perhaps it's the way that this album took only three weeks to record - but that's much longer than usual for them. Perhaps it's the way they use old recording equipment, and consequently become instantly reminiscent of British classic rock bands like the Stones and the Who... perhaps it's their utmost refusal to force themselves to write generic ear-candy, even if it means that their stuff is absolutely crazy. Brilliantly crazy, in fact. This album storms through your head like a band of marching spiders on acid. Think Fantasia with Mick Jagger. Think two people playing as many instruments as they can. And at this point, I'd like to make a crucial technical point. This is really extremely annoying to the daughter of a multi-tasking folk musician: so much so that I actually had to ring my Dad and have a moan. Please take note that the bagpipes being played in Prickly Thorn, Sweetly Worn and St. Andrew are NOT, repeat NOT Highland Pipes. They are 'Cauld Wind Pipes' - indoor smallpipes, which accounts for their muted sound. I realise none of you will really care, but I don't care about you not caring. It matters - not least because it illustrates one of the whole points about the Stripes. They're prepared to find something different - and to use it well, in a non-clichéd way. It doesn't matter that Jack Black can't really sing, because what they're doing is something quite different: they're going forward by looking back. They've picked out their favourite parts of the last century or so and added a unique spin that is somehow able to build on these traditions and sounds without detracting from them. 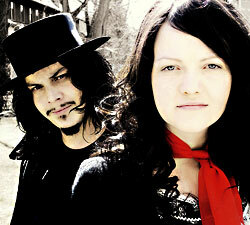 Yes, The White Stripes are about more than novelty. That's why this is album number six on a list of pretty good albums, during which they've maintained a distinctive style and huge deal of edge. Recommended if you fancy something more than a little different. Has Meg learned to drum yet? I consider that to be a wholly rhetorical question. I actually quite like the single of the same name... might have to look for the album, I didn't really enjoy their previous album though.